Stained glass can do three things: beautify buildings, control light, and tell a story. Well-to-do Romans were first to use colored glass windows–in their homes, back in the first century AD. Early examples of stained glass windows can also be found in some of the palaces and mosques in the Middle East. In Jarrow, England, at St. Paul’s Monastery, pieces of a stained glass window dating from 686 AD were found. Chancel window from church in Chilham, Kent, UK, Passion of Christ with scenes from Old Testament. Traditionally, to make stained glass, artisans mix potash and sand and heat it to approximately 3000 degrees Fahrenheit, adding various metallic oxide powders to create different colors. The glass is then flattened into sheets while still pliable. The artists create a blueprint, or cartoon, of the design on a large board. The sheets of glass are laid on top of the blueprint and cut into the approximate sizes needed. (In the olden days, details were painted onto the stained glass windows with a special paint made from ground glass and iron filings suspended in urine or wine; this mixture helped block light and define designs.) The finished pieces of glass are fitted into C- or H-shaped strips of lead called cames. The cames are soldered together to create panels, which are then put into an iron armature, completing the window and readying it for installation. Cross section diagram of stained glass (3) joined by lead cames (1 and 2). Illustration by Rickpelleg*. The stained glass windows so familiar today did not come about until the 10th century, with the construction of Gothic cathedrals. The earliest known stained glass pictoral is a portrait of Christ from the 10th century, discovered at the Lorsch Abbey in Germany. The oldest complete stained glass windows were those of Augsburg Cathedral in Germany, constructed in the late 11th century. St. Michael the Archangel, from the church of St. Mary the Virgin, Buckland, Oxfordshire. Photo by Lawrence OP. …God is light: in him there is no darkness at all (1 John 1: 5b NIV). One of the most important advancements in Gothic architecture was the development and use of the flying buttress, which served as an arched exterior support that could transfer the excess weight of a building outward. This allowed an increase in window size as well as more wall space to be occupied by windows. 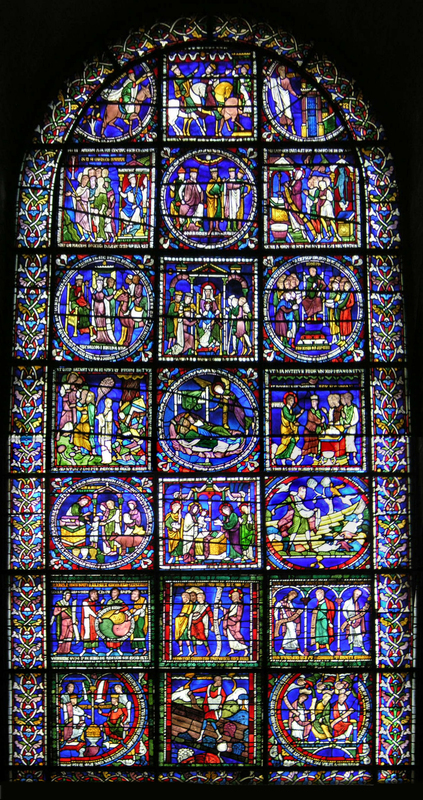 The windows made during medieval times were mostly religious in theme and served to tell Biblical stories to lay people who could not read, as well as beautifying the churches. The windows probably had a more profound impact on the people than the sermons themselves. Portraits of saints depicted in the windows used symbols to convey details about their lives and deaths. Gothic windows were generally tall and spear-, wheel-, or rose-shaped. 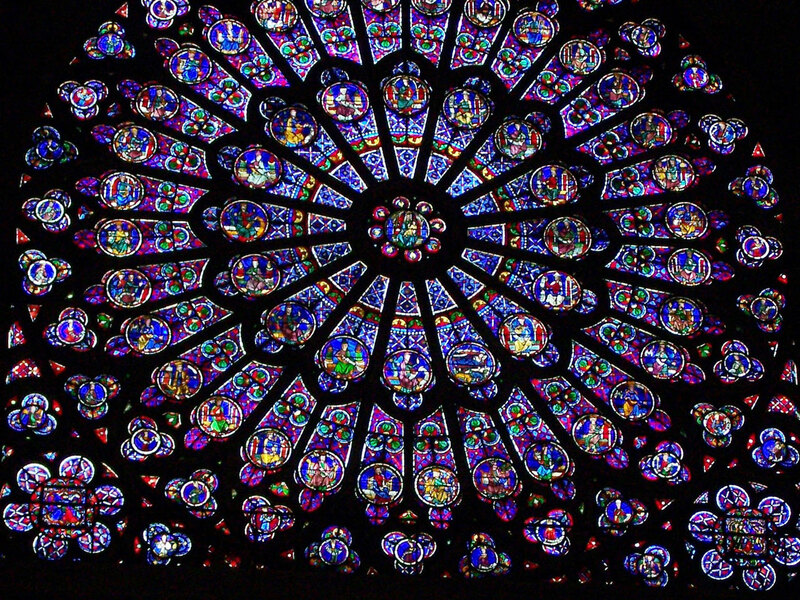 A good example of Gothic stained glass windows are those of the Notre Dame Cathedral in Paris, which holds one of the largest rose-shaped windows in the world. The primary subjects of Renaissance windows were still Biblical, but the figures are dressed in Renaissance-style clothing. The scenes still feature symbolic imagery, perhaps even more so than in the Gothic period. 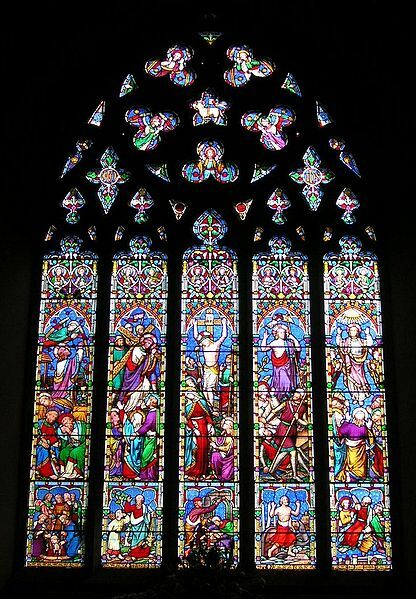 At this time, even non-religious scenes were included in church windows. Stained glass was used in buildings like town halls and wealthy homes, although the panels of homes were small and usually just painted on. The use of linear perspective is seen in activity taking place in the background, while primary activity occurs in the foreground. Due to the humanist movement of the Renaissance, faces display more emotion than in older specimens. Between the Renaissance and the mid-19th century stained glass windows fell from favor. This was largely due to changes within religious norms of the time – the church had been the supporter of the arts, and the new Protestants did not believe in fancy art work and decoration in church buildings. By 1640, stained glass was rare and only small panels featuring heraldry were used for homes and city halls. The English Parliament demanded all images of the Virgin Mary and the Trinity be removed from churches, so many stained glass windows were smashed by fanatic vandals. The destruction only stopped because it was too costly to replace the windows. Stained glass window making became a lost art. 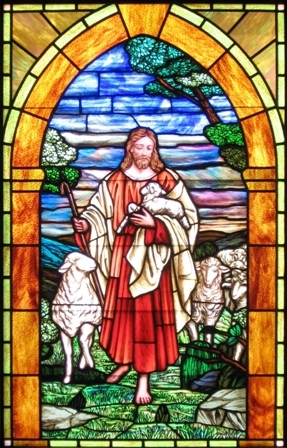 The Good Shepherd, or Finding the Sheep that was Lost, First Lutheran Church, Washburn, North Dakota. Today, some churches, synagogues, and mosques are still constructed with stained glass windows, though many Protestant denominations eschew them. The windows of Louis Comfort Tiffany, Marc Chagall, and Frank Lloyd Wright are fine examples of modern stained glass windows. This video about the history of stained glass shows the fragment of the Jarrow window mentioned above and the role of artists in Brooklyn, NY. Also, a window maker is shown breaking glass into the required shape. 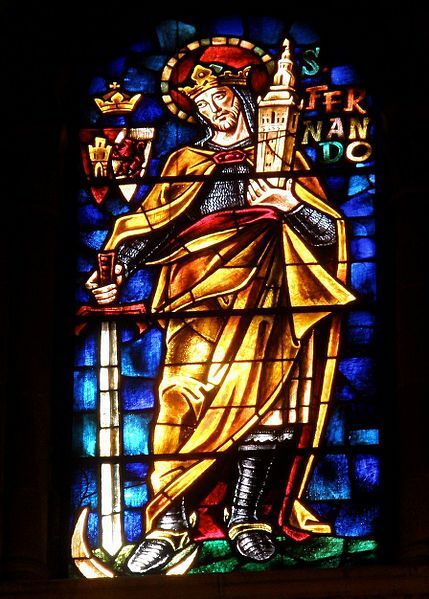 The information in this article came from two articles online, “The History of Stained Glass Windows” and “The Development of Stained Glass in Gothic Cathedrals.” To learn more about the process of making stained glass, see this wonderful article from Khan Academy, which includes photographs. *Lead cames illustration by Rickpelleg, shared under Creative Commons license 2.5.